Meredith is launching a new adult coloring club and social platform in partnership with Andrews McMeel Universal (AMU), publisher of the Posh brand of adult activity and coloring books. Previously chief digital officer at Meredith, Wilson was tapped to oversee driving consumer revenue for the company last fall, focusing specifically on diversifying digital revenue streams through developing partnerships, programs and memberships, he told Publishers Daily. It is a move away from ad-supported editorial and focuses on offline experiences. Posh Coloring Studio is the first project to launch from Wilson's team, with another scheduled for this summer and more in future. Wilson and his team built the membership platform behind the coloring club so that future programs launched by Meredith can live on the platform. Membership to the coloring club is available for a one-week free trial, and then $5.99 or $7.99 a month, depending on whether members choose an annual or quarterly plan. Fifty new coloring designs will be uploaded to the platform each month. The site already has over 1,000 designs available to print, so that members can color offline and print as many copies of the designs as they want. Themes range from Activities, Animals, Architecture, Around the World, Fashion, Nature, Patterns, Seasonal, Soothing and Spirituality. 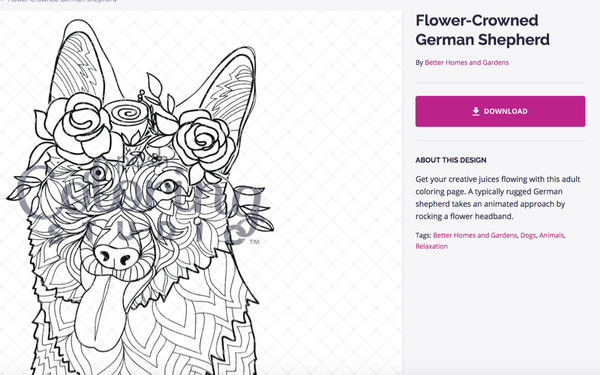 Each Meredith brand has designed its own adult coloring pages to contribute to the club, such as animals by Better Homes and Gardens and snacks by Martha Stewart Living. Ads for the club will run within Meredith’s magazines and across its sites, as well as in various brand newsletters. Members can connect through social communities and share their work with fellow Posh Coloring Studio subscribers. Adult coloring books continue to top bestseller lists, with an estimated 12 million sold in the U.S. in 2015, according to Nielsen Bookscan. They are increasingly used to help adults reduce stress and promote overall wellness. Wilson said adult coloring books are especially popular with millennial women and there are few competitors in the space. Some 33% of 18- to 24-year-old women have bought a coloring book. Of that group, 66% color weekly. “When you look at the size of those stats, this can be pretty big. We have access to that target market,” Wilson said. Meredith and AMU claim they can reach more than 70% of millennial women in the U.S. together. AMU has its Posh coloring books for sale on the Coloring Studio site, with a 20% discount for members.